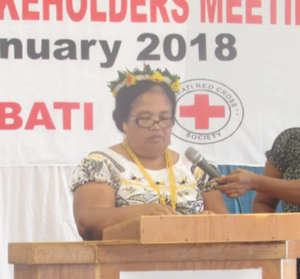 KiLGA was one of the CSOs invited to the Kiribati Red Cross Society (KRCS) launching of its 2018-2020 Strategic Plan on Monday 22 January, 2018 at the Kiribati Institute of Technology (KIT), officiated by the First Lady and KRCS’ Patron, Madam Teiraeng Maamau. Other guests include visiting Red Cross officials from Fiji, CSOs’ representative and the KRCS’s youthful volunteers. On Tuesday, 23 January, the Society held its Partners Meeting, also at KIT, which saw representatives from diplomatic missions, UN agencies, government departments and CSOs, come together to view the Red Cross’ Strategic Plan and contribute to its implementation, as development partners and technical advisors. KiLGA’s EO was invited to present an overview of the Kiribati state.